Juken Sentai Gekiranger is the 31st Super Sentai series, taking over from GoGo Sentai Boukenger. 4000 years ago, a martial art known as Jūken was created by man named Brusa Ee in which one mimics the abilities of animals as well as trying to attain spiritual peace. However, dissent grew among the creator's ten students. Three of them believed that they should use the suffering and hatred harnessed within humans to increase their power, using their power to assume monstrous forms; the Three Kenma. After murdering Brusa Ee, the Kenma gathered followers to practice an evil form of the Jūken style known as Rin Jūken Akugata. The other seven students believed that true strength should come from within and engaged their former friends in a great war, ending the fight with a forbidden technique to seal the Kenma' powers at the cost of losing their own human forms in the process, becoming the Seven Kensei. Followers of the Kensei created the Geki Jūken Beast Arts school: the Jūken of justice whose sport discipline enhances the human body with the self-produced positive Qi called "Geki". It is taught by Grand Master Shafu, one of the seven Kensei, using a sports goods company named "SCRTC" as a front. In the present day, a fallen student from the Geki Jūken school named Rio turns to the Rin Jūken style, rebuilding the Rinjū Hall and bring the long-dead Rin Jūken users back to life as kyonshi to collect Rinki, Geki's polar opposite Qi, in order to resurrect the Three Kenma so that through them, he can become stronger. To fight them, Shafu trained Ran Uzaki (GekiYellow) and Retsu Fukami (GekiBlue). Along with Jan Kandou (GekiRed), a feral boy raised in the woods, the Gekiranger team is formed and later joined by two other Geki Jūken users, Retsu's presumed dead brother Gou (GekiViolet) and Ken Hisatsu (GekiChopper). However, an even greater evil is using the two sides for its own agenda. The Gekirangers themselves, while not awful, are probably the weakest link in the casting. Jan is incredibly annoying and hyperactive, speaking in his own nonsensical language. His growth at the end of the series comes a little too late for my liking, but its better than it not being there at all. Ran is severely underused, especially when taken into consideration that she's the team leader, so comes off quite flat. Retsu starts in much the same way, but grows as character once Gou arrives on the scene. Gou himself was certainly my favourite Gekiranger, pulling off the badass loner turned badass team player really well, complete with an epic werewolf introduction. Ken, much like Jan, started off as annoying, but grew on me as his time on the series went on. I also enjoyed how he had to earn SaiDain rather than being initially introduced with it. The kenshi are great bunch of characters, no matter how you may feel about the animal costumes. While I felt this worked really well for some of the characters (Shafu, Bat Lee and Sharkie Chan) there were others where it fell a bit flat (Elehung, Michelle Peng and Bion Biao). Each of them have their own unique skills and personalities, with some playing off each other better than others but as a whole making a colourful and respectable force. Keen eyes will notice that each of the Kensei is named after a prominent figure in martial arts movies. Gekiranger's real strengths lie in its antagonists. Rio is by far and large the best character in the series, his desire for power and need to be better than everyone else the plot's main driving force. Stealing every scene he's in, Rio's character is interesting in that while he very much remains a threat, due to his relationship with so many of the cast he never feels like a generic villain, receiving far more development that almost anyone in the show. But what struck me most is that Gekiranger never feels like a simple good vs. evil plotline - the battle between the two schools is one based just as much on rivalry as it is between their allegiances, making the exchanges all the more exciting. When Mele isn't acting like a lovesick teenage towards her master, she's an equally engaging character. Her loyalty and love (when it isn't being piled on too thickly) are interesting character traits, and her honour when it comes to fighting makes for some of the series' best episodes. Even when Rio isn't in charge these two characters exploits deservedly remain the focus, which helps shape the twists and turns the series' climax has to offer. Their fighting form designs are superb, as are the other Rinrishi that appear (ostrich and pig monsters non withstanding). The two other antagonist groups are the three kenma on Rin Jūken, and then in the last quarter the GenJūken -the show's "big bad". The three kenma's more menacing animal designs is are a great foil to their more friendly animal appearance. Meanwhile the GenJūken offer an injection of mysticism to the monster designs, and while not as strong as the original ones displayed the different styles between the groups well while keep the flair of the show much the same. Their leader Long proves to be an excellent main antagonist, devious and sowing seeds in the story all along. Gekiranger's aesthetic when it comes to the suits themselves isn't one I'm overly fond of. The costumes are very basic, primarily made up of one colour with some black to break things up a little in places. The helmets are equally basic. 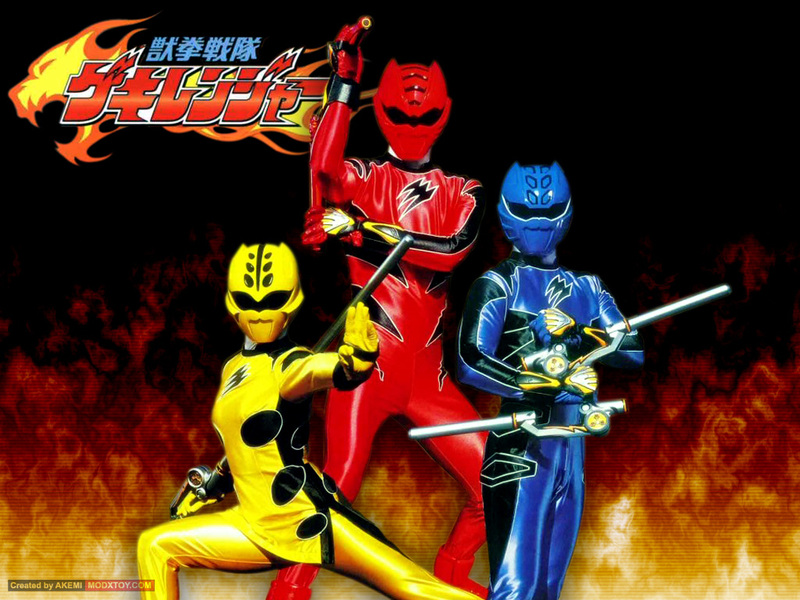 Later the three main characters master the power of KaGeki and receive 'super mode' upgrades, the suits then having an much needed infusion of white and sharper details on the helmets. GekiViolet and GekiChopper's suits are better, they all rank pretty low on my list of favourite sentai suits. Certainly different, but too plain to be what I personally would call good. The Gekiranger equipment was also mixed. What I really liked about the change devices for the season was that since there were 3 slightly different styles of fighting between the team, it meant there was a plausible reason for them all to have different ones. Jan, Ran and Retsu all used GekiJūKen and so had the GekiChangers, while Gou fought using ShiGeki and so had his GongChanger. Ken also used GekiJūKen, but his weapon-based style gave him the SaiBlade. I wasn't too fond of the projectile side of the SaiBlade, given that I appreciated the series more simply for avoiding weapons like that as much as it could. The same could be said for the GekiCannon, which while different to other giant cannon weapons in Sentai series' had the same effect. Gekiranger's mecha line up is particularly interesting, as they aren't actually mecha at all. The team's Geki beasts are in fact physical manifestations of each ranger's geki, and are brought together to form a Geki giant. While the individual animals are all excellent, I thought the giants were a bit mixed. First we have GekiTouja, the first and my favourite of the 3 (or 4 depending on how you count it) giants in the series. GekiTouja stands out from previous sentai 'mecha' by being a lot slimmer and agile, rarely using a weapon and instead focusing on more hand-to-hand techniques. It brings a refreshing change to the "oh so predictable" battles, and GekiTouja is a unique and colourful design. It even came with some power ups in the form of the elephant, bat and shark spirits. Coincidentally, the order they're introduced is also the order I'd rate them - the elephant is great, the bat so-so and the shark pretty ridiculous (although underwater battles do make a pretty cool spectacle). These add on's could also be used on the second Geki giant - GekiFire, who I wasn't so much a fan of. The combination of a gorilla, gazelle and surfing penguin didn't really flow as well as three cats, and the overall design was more akin the standard sentai fare, much to my disappointment. Luckily, GekiTouja kept making regular appearances as GekiWolfTouja...the difference being that he had a wolf for a leg instead of a cheetah. Don't get me wrong, while I'm happy to see as much of GekiTouja as possible, giving GekiViolet an offshoot of an existing giant where his beast isn't even the main limb just seemed to not give the character enough credit if you ask me. Finally there was GekiChopper's SaiDain, who was a bit different to the rest as it was actually an existing physical being. SaiDain could become the giant SaiDaiOh, which while looked good didn't really fit with the aesthetic of the rest of the giants (obviously due to its different origins). SaiDain also combined with GekiTouja and GekiFire to create SaiDaiGekiFire and SaiDaiGekiTouja respectively. Finally, as rarity in the franchise - Rio and Mele also had beast spirits that could combine with GekiTouja, creating GekiRinTouja, who is fantastic in every respect. I went into Gekiranger not expecting a lot, but the series took me completely by surprise. Despite having a fairly weak cast and some design choices I wasn't too fond of, its superb plot and supporting cast were enough to keep me hooked throughout the twists and turns of its 49 episodes. While not perfect, Gekiranger is a thoroughly enjoyable series and comes highly recommended to everyone, especially people who are looking for a Super Sentai series that is a little different from the norm.